What makes Bledington’s King’s Head the Good Pub Guides top boozer? Good beer, great food, a friendly barman, open fires? Or is it, as my son grumbled as we climbed into the car “one you can walk to”? Some people are never happy. We were heading to The King’s Head Inn in the Cotswolds, Pub of the Year in The Good Pub Guide, published this week. It ticks all of the boxes above – although you’ll have to be a resident of Bledington for the final one to apply. Once we arrived, however, the boys mood lifted. The 16th-century former cider house stands perched on the edge of the village green, with a sign by the door reading: “Dogs on leads, bantams on loose”. The low ceilinged bar, lit with a golden glow from the old-fashioned twin-shaded lamps, had flagstone floors strewn with red rugs and an assortment of cushiony chairs, but no balefully flickering slot machine. Regimental locker plates gleamed over the inglenook fireplace, where a log smouldered even on a September evening, just enough to take off the chill. It all promised a good evening. It was never going to be the city, though. Brought up in the Cotswolds, in 2000 Archie upped sticks with his wife Nicola and their six-month-old baby and moved to The King’s Head. The family farm is just a couple of villages away and supplies beef to the pub, while lamb comes from his aunt’s flock of black Welsh mountain sheep in Oddington. Nicola, a milliner by trade, transferred her skills from hats to headboards and hearth rugs, ditching the pub’s old black tables and pink napkin fans for scrubbed oak and muted green paintwork. Within a couple of years the pub’s bedrooms were refurbished, too, with Cotswolds woven blankets, Cole and Son hand-blocked wallpaper and the pub’s own locally made Bantam range of soaps and lotions – the name a nod to those poultry kept in the garden. It’s been a successful formula. In 2006 they were chosen by the late Duchess of Devonshire to take over the lease on the Mitford family’s pub The Swan at Swinbrook. David Cameron lunched there with French President Francois Hollande in 2014. “We had to close the pub,” recalled Archie, as we admired a picture by the bar. “One of our friends still managed to walk in,” added Nicola cheerfully. Last year they took over The New Inn at Coln, bringing the count of Bantam pubs to three. Stapley has worked on the guide for 35 years, during which the business has changed “out of all recognition. 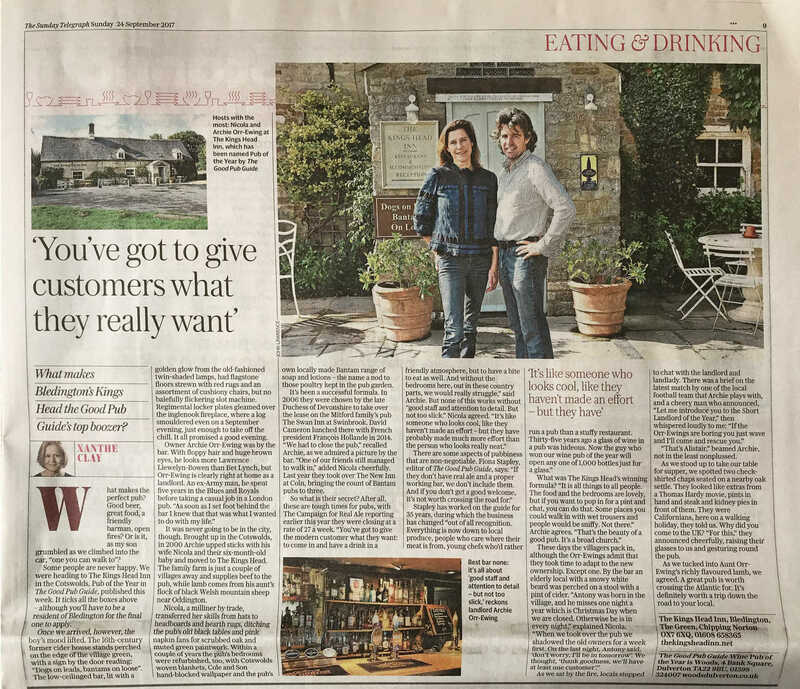 Everything is now down to local produce, people who care where their meat is from, young chefs who’d rather run a pub than a stuffy restaurant. These days the villages pack in, although the Orr-Ewings admit that they took time to adapt to the new ownership. Except one. 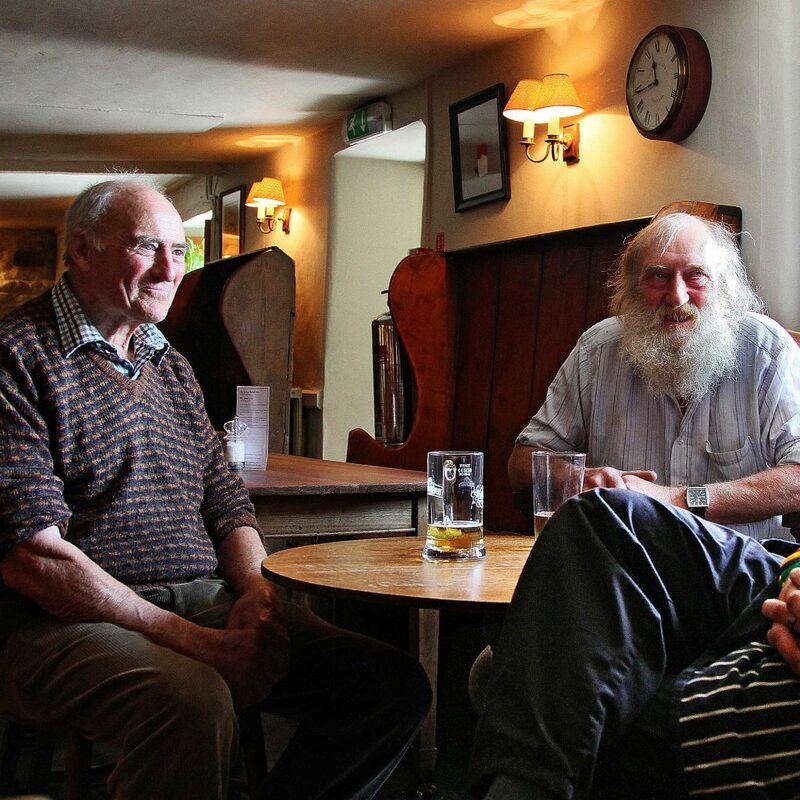 By the bar an elderly local with a snowy white beard was perched on a stool with a pint of cider. “Antony was born in the village, and he misses one night a year which is Christmas Day when we are closed. Otherwise he is in every night,” explained Nicola. “That’s Alistair,” beamed Archie, not in the least nonplussed. As we stood up to take our table for supper, we spotted two check-shirted chaps seated on a nearby oak settle. They looked like extras from a Thomas Hardy movie, pints in hand and steak and kidney pies in front of them. They were Californians, here on a walking holiday, they told us. Why did you come to the UK? “For this,” they announced cheerily, raising their glasses to us and gesturing round the pub. As we tuck in to Aunt Orr-Ewing richly flavoured lamb, we agreed. A great pub is worth crossing the Atlantic for. It’s definitely worth a trip down the road to your local.